Conjugated systems are structures that contain alternating double and single bonds (or, in some cases, a double bond that is next to an atom with either a lone pair or a vacant orbital). Conjugated systems are usually at lower energy than regular double bonds because the electrons involved in bonding are delocalized; they are spread out over a greater area and thus can have a longer wavelength. For example, the -bonding system for 3-butene-2-one (or methyl vinyl ketone) is described by orbitals involving both the carbonyl group and the alkene group. These two groups become linked together so that there is not longer an independent carbonyl nor an independent alkene, but one "enone" (a term taken from the words alkene and ketone). Because of that extra stability, it might not be surprising that conjugated carbonyls are often a little slower to react than regular carbonyls. The surprise is that conjugated carbonyls can sometimes give additional products in which addition does not take place at the carbonyl. The product shown above is called a conjugate addition product, or a 1,4-addition product. In conjugate addition, the nucleophile does not donate to the carbonyl, but instead donates to an atom that is involved in conjugation with the carbonyl. This additional electrophilic position is sometimes called a "vinylogous" position (from the word vinyl, which refers to that CH=CH2 unit next to the carbonyl). Conjugate additions (or 1,4-additions) can occur when a carbonyl is attached to a C=C bond. Draw a mechanism with curved arrows for the conjugate addition shown above. Regular additions to carbonyls are sometimes called 1,2-additions, whereas conjugate additions are called 1,4-additions. Show why. Remember that we can look at another resonance structure of a carbonyl, one that emphasizes the electron-poverty of the carbonyl carbon. It's not a good Lewis structure because of the lack of an octet on carbon, but it does reinforce the idea that there is at least some positive charge at that carbon because it is less electronegative than oxygen. Extending that idea, we can draw an additional resonance structure in a conjugated system. That third structure suggests there may be some positive charge two carbons away from the carbonyl, on the β position on the double bond. The idea that there are two electrophilic positions in an enone is reinforced by the picture of the LUMO (the lowest-energy "empty" frontier orbital, the virtual place where an additional electron would probably go). When a lone pair is donated to an electrophile, the electrons are most likely to be donated into the LUMO. 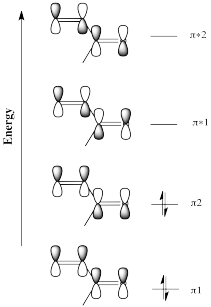 Although it isn't obvious from the cartoons we often draw for molecular orbitals, quantum mechanical calculations suggest that the LUMO is "larger" at the carbonyl position as well as the β-position on the vinyl group. in which pC1 is the p orbital on the carbon on the left, pO is the p orbital on the oxygen, and so on. The letters a, b, c and d are just numbers; they are the coefficients in the equation. The result of the molecular orbital calculation in this case suggests that the numbers a and c are a little bigger than b and d. Incidentally, it also suggests that a and d have opposite sign from b and c (maybe a and d are positive numbers whereas b and c are negative numbers), meaning that a and d are out of phase with b and c.
In any case, we sometimes think of the large LUMO on particular atoms as being an easier "target", an easier place to throw the incoming electrons. These mathematical results really just reflect what we would expect from the resonance structures. Indicate whether the following systems are capable of undergoing conjugate addition, and show why or why not. Having two possible products of a reaction can be confusing. How do you know which one will result? Often, you don't know. Frequently, both products result, so there is a mixture of commpounds. However, one product often predominates. In conjugate addition, there are a few different factors that may tilt the reaction in one direction or another. Possibly the simplest reason is steric effects. Maybe one of the electrophilic positions is more crowded than the other, and the nucleophile can access that position more easily. Addition of a nucleophile often occurs at the least crowed electrophile. In each of the following cases, indicate whether the addition of a nucleophile will be via 1,2-addition, via 1,4-addition, or an equal mixture. The hard/soft acid characteristics of the two electrophilic positions also influence the reaction. The carbonyl position is closer to the oxygen, of course, and it makes sense that the oxygen would have a greater influence on this carbon. The carbonyl position, with its more concentrated positive charge, is a harder electrophile. The vinylogous position, with less positive charge, is a softer electrophile. Vinylogous positions are soft electrophiles. Soft nucleophiles are more likely to react with soft electrophiles, and hard nucleophiles are more likely to react with hard electrophiles. The amount of negative charge concentrated at the nucleophilic atom is the biggest factor determining hardness. The lower the charge, or the more spread out the charge, the softer the nucleophile. Indicate whether the following nucleophiles are more likely to undergo 1,2-addition or 1,4-addition. There are other factors that play roles in influencing the course of these reactions. Sometimes the mechanism of reaction is slightly different under different circumstances. The presence of Lewis acid catalysts can also influence reactivity in these systems, but not always in a predictable way. Lewis acid catalysts can influence whether a reaction proceeds via 1,4-addition.